AllegroMedical.com presents The 3b Scientific Anatomical Chart - Musculature, Sticky Back . Sticky-back charts are printed in full color on durable vinyl with adhesive backing. The non-destructive adhesive affixes to walls, doors, windows, whiteboards, metal, cabinets and most any clean surface. Can be removed and re-affixed to surfaces many times. Human anatomical charts and posters are helpful aides in teaching human anatomy, patient education and medical studies. All anatomy charts are available in 19.7 x 26.6 in (50 x 67 cm) unless otherwise stated. 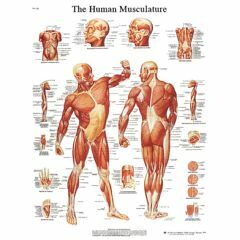 Anatomical Chart: Musculature; chart measures: 20x25in. 50x67cm. sticky back.